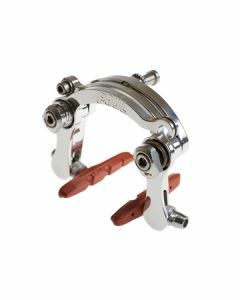 The Racer brake is a centerpull caliper brake with long reach arms and plenty of clearance.. It is important to note that the Braze-On Racer does not mount to brake bosses in the standard cantilever position, and it will not work with U-brake bosses. Please refer to our support article on Braze-On Centerpull Brakes for more information. Reach is determined by the height of the centerpull brake bosses, which can be positioned by a framebuilder to match up with 700c, 650b, or 26" wheels.